Everytime a petty bish moment happens due to hurt people hurting people, I think these thoughts…of course I’m smart enough to know being petty never helped any situation. It’s normal to hear about baby momma drama and deadbeat dads. The innawebs runneth over with stories about folk subscribing to the foolafucooniggatry (shout out to Rox for this fantabulous word) that exists in these two positions. What people rarely hear about are the people who date “baby mommas” and “deadbeat dads.” Don’t get my quotations wrong there are many men and women who own those positions with all the negative connotation that comes with, but what I’ve learned through the process of dating a man with a child that more times than not neither of those titles are well deserved. Truth is, hurt people hurt people and when children are involved the stakes are even higher and the crazy even crazier. My prior serious dating situations were always childless. Not because I dislike children, I like them more when I can hand them back to their parents, but more so because of the saddled stigma that comes with dating a “deadbeat dad” or encountering the troll that is a “baby momma.” The real life and rumored stories of being caught in the middle of a love/hate relationship scared me enough to stay way clear of that drama. 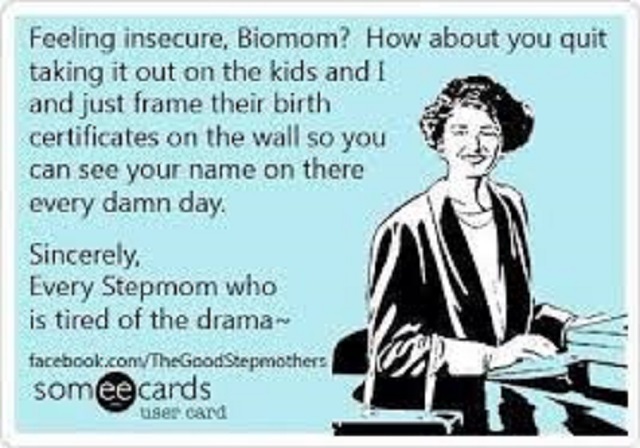 As I’ve mentioned many times in the trust tree nest, I detest drama. In particular I detest petty bish drama. Dating someone who has a child with someone else not only opens the door for petty bish drama (of the male and/or female variety) it invites that hashish to sleep in your bed. That shyt snuggles up with you at night and makes you wonder if the person beside you is even worth the nonsense. Petty bish drama breeds doubt. Doubt eats relationships from the inside out…but that’s a conversation for another date and time. For me, far beyond the dramatics of hurt people was the unfathomable notion of developing real emoticons for some other woman’s child. That’s the lens by which I’d always viewed dating someone with a kid. By chance of fate I started seriously dating My Present who came with a Gift. Little by little I’ve unpacked that Gift until it feels as close to mine as I could possibly imagine having never birthed a child myself. Which from my standpoint is amazing and terrifying at the same damn time because I’ve never wanted it. Suddenly some other woman’s child looked up to me when he hurt and wanted to be hugged. Some other woman’s child looked to me for reassurance when he’s afraid. Some other woman’s child took my hand to cross the street to feel safe. Some other woman’s child fell asleep in my arms at night and miraculously wasn’t just some other woman’s child anymore. I can’t tell you when that happened. And for as natural a transition as it’s been for me to accept and love some other woman’s child it’s been extremely uncomfortable at times because there is some other woman on the opposing side of My Gift. How strange it must be for her. It must be gut wrenching to know her child loves another woman. And not just a random teacher or a fly by night baby sitter who will disappear in a week, but the Present of her Past. Not that I replace her as My Gift’s mom, I have no delusions of grandeur, but that her baby’s formed a real life mothering connection with someone other than she. How strange it must be for her. More than strange, a bit painful. Does she think about the nights when I stay up until My Gift’s breathing gets heavy and he drifts off into some slumber land? Does that image sit well with her or does it conjure feelings of jealousy and rage, because I’ve usurped her position in a family of her creation? Does she think I’m an imposter; some inferior version of who she is whose presence will be short lived if she creates enough turmoil? And although I can’t relate to how she behaves, I sympathize with being ousted regardless of the reason from something that at one point belonged to her. How strange it must be for her. To know she’s pained makes it sometimes uncomfortable to love My Gift, but I can’t deny my feelings. My Gift: Fae Fae do you love me? Me: Of course I love you. My Gift: Do you love daddy? Me: Yes I love your daddy. My Gift: Do you love my mommy? I said those words with no hesitation. But it floored me. It made me think about whether I’d lied to him or if I in fact do love her. I’m not crazy. To be clear I don’t like her…that’s not fair. I don’t dislike her. I barely know her. The chick I’ve come to know through this situation is not one I’d ever share a whole meal of food with; my personal friendship gauge. Absent My Present we live life in completely different circles, but I do feel a sense of fondness for her. Merriam Webster tells me that fondness is a synonym for love so therefore she is loved by me. As odd as it may sound to anyone else I can’t hate her. She’s half the composition of My Gift. As batshyt as her behavior can and will be, I know that some (God knows I hope it’s more like most) of it comes from a deep inner pulling to be the best parent she knows how to be. And because of her I know this pulling. That burning desire to do it right because someone else’s life hangs on your decisions. For that I can never hate her, even when I question her actions. Life is comical and this situation has taught me so many many things about myself and others…feel free leave your piece in the comments Lovelies and as always to share is to care and hashish. Just like I expected, I know this struggle. & you articulated it well. It’s quite the unique role to play & 1 that is typically so rewarding that the confusion is bearable. I hope that your experience has a better outcome than mine did, still stuck in some kind of strange limbo with my oldest Once Upon A Sons going on 8 years post-relationship. Wishing you & your little family unit the best.